ViTrox Technologies will exhibit in Hall A2, Booth #425 & 427 at the productronica International Trade Fair, scheduled to take place Nov. 10-13, 2015 at the Messe München exhibition center in Munich, Germany. The company will display the V810 S2EXi In-line 3D Advanced AXI system and award-winning V510 Optimus 3D AOI system. V810 S2EXi can handle boards up to 19″ x 24″ which is 10 percent larger than its predecessor – the V810 S2 system. It supports boards up to 280mils thick and 4.5kgs. With the introduction of the Motorized X-Ray Tube and Motorized Filter Height Sensor (FHS), V810 S2EXi offers greater top clearance up to 50mm and bottom clearance up to 70mm. High accuracy and repeatability are achieved with this motorized close-loop design. V810 S2EXi supports Variable Magnification (VM), including 23um, 19um, and 11um. 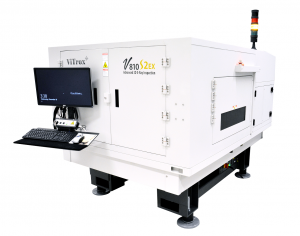 This feature enables V810 S2EXi to inspect smaller pitch component joints, such as 01005s and micro BGAs with joints less than 250 microns at 11 micron resolution. Magnification configuration becomes fast and simple by adjusting the motorized Z-axis and FHS. The V510 Optimus 3D AOI uses 2D + 3D inspection concurrently to achieve high productivity and high detectability. It boasts capabilities that are unmatched by other existing solutions in the market. The system is able to detect various types of challenging defects, such as Lifted Lead, Coplanarity, Black color PCB / Multicolor PCB, Presence / Absence, small components like 01005/ 0201 and many others. V510 Optimus 3D AOI is coupled with structured lighting for 2D illumination with multiple color LEDs. The revolutionary multi-angle multi-color illumination capability allows multiple images to be acquired for each view. The robust design of V510 Optimus 3D AOI is able to cater for multi-platform requirements, allowing mix-and-match combinations with AOI in XL, XXL, Dual Lane and Flexible Dual Lane models. The V510 Optimus 3D AOI comes with Dual Lane options, upgradable to XL model for bigger board size inspection, as well as the extended conveyor.